Mortimer Community College speed dating business event. A business-themed speed dating event has helped students at a South Tyneside school find out more about the world of work. Mortimer Community College opened up its hall to a number of companies who agreed to send in representatives for pupils to quiz. 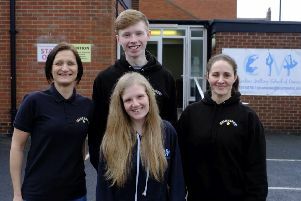 Former students from the school in Reading Road, South Shields, also took up places at the event in the hope of inspiring the next generation to follow their career aspirations. The three hour buisiness-themed speed dating event was suppored by Business in the Community - which is part of the Prince’s Trust. Companies taking part included South Tyneside Council, Department for Work and Pensions, Siemens, Barclays, M&S and KPMG as well as ex-students who have taken up employment in midwifrey, hairdressing and administration and one former student who is currently studying for his Bar Exam in law. A total of 191 Year Nine students took part and heard about the range of different carrers and pathways into them as well as interveiwing as many people as possible from the world of work. Headteacher, Simon Hignett said: “It is so important that our students begin to get career advice from the local business environment as early as possible. “It was fantastic to see Mortimer students collaborating with local business people. “It was also great to see some ex Mortimer students returning as successful business people, to pass on their advice and encouragement to our current students.